Magnum launches vegan ice cream in Australia, and it’s good! Finally the wait is over for Magnum vegan icecream. This pea protein non-dairy vegan ice cream coated with dairy-free chocolate is available for sale in the UK, Europe and Australia. It signals a shift- many global food critics are saying the future of icecream is vegan, and that when consumers try it, there will be no going back. Unilever says it was never marketed as ice cream but as iced confection. (In Australia only products with cream or milk can be called ice cream). 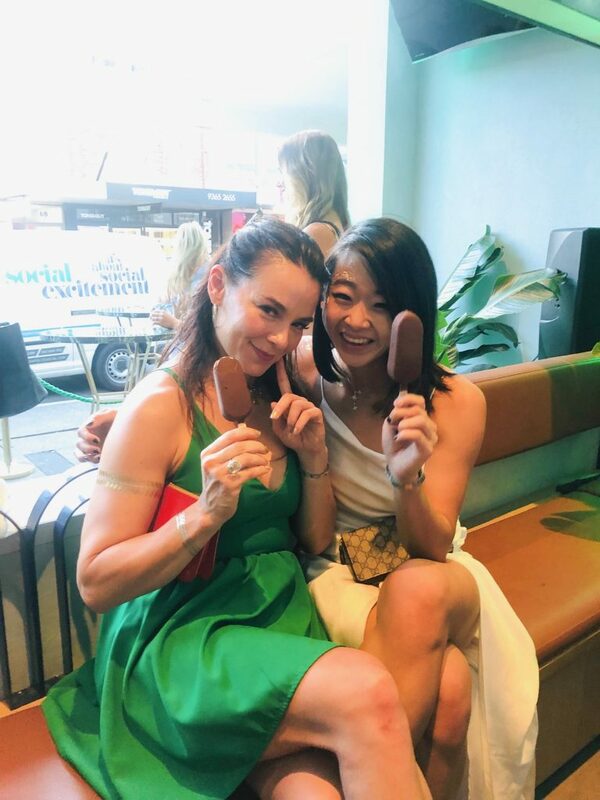 Renae with Blogger @lichipan in Sydney at the launch of vegan Magnum. The Magnum non-dairy products have been certified Vegan by Vegan Action. Branded vegan icecream is not new to the food industry. Cornetto has vegan ice cream cones, which use soy -based ice cream, hazelnuts and retain the cheeky non-diary chocolate at the bottom of the cone. The UK even has its own Ben & Jerry’s non-dairy flavour, Cocconutterly Caramel’d. Going green at the launch of Vegan Magnum. The cult supermarket healthy brand Halo introduced non-diary in 2017, and continues to release new vegan flavours. Experts say the vegan trend is being pushed ahead by multiple consumer objectives. These include sustainability, with vegan supporters saying livestock in Australia contribute to global warming as well as significant water wastage. There are multiple health reasons people want to die up dairy and other consumers are concerned about animal welfare. Click here for more about Vegan ice creams.